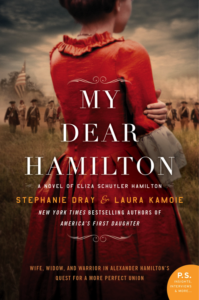 Stephanie Dray and Laura Kamoie are the authors of the new novel My Dear Hamilton: A Novel of Eliza Schuyler Hamilton. They also have written America's First Daughter. Dray lives near Washington, D.C., and Kamoie lives in Annapolis, Maryland. Q: Why did you decide to focus on Eliza Schuyler Hamilton in your new book? A: Our new My Dear Hamilton was in part inspired by the musical--I doubt this is any surprise! Laura happened to see it during its first week on Broadway, and the very next morning we talked about Eliza and decided to make her our next heroine. And we pitched the idea to our editor that very afternoon--that’s how sure we were! 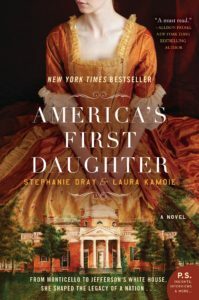 Now, we had already been searching for the perfect historical figure after writing about Patsy Jefferson in our first novel, America’s First Daughter, and we loved the idea of writing next about a founding mother of the north and offering readers of both a comparative perspective on how women from various parts of the new nation experienced the birth of the country. We also wanted to tell Eliza’s story because as far as we are aware, no one else had told the whole of it--in either fiction or non-fiction, and so My Dear Hamilton covers nearly the whole of her 97-year-long life. Q: How did you research her life, and what did you learn that especially surprised you? A: Since Eliza appears to have destroyed most of her own letters, we had to pull resources from everywhere we could find them. That involved significant usage of the Founders Online website via the National Archives, as well as archival research in New York and Albany. We also used a wide variety of papers from other people and institutions of the era, including, for example, Tench Tilghman’s journal, the papers of other members of the Schuyler family, papers of an investigation from the Historical Society of Pennsylvania, the Orphan Asylum Society papers at the New York Historical Society, and the published recollections of the Washington National Monument Society. That’s just the basics of what you have to do when you choose to write about a real person, though I’m not sure either of us would characterize the research work as having been quick! What really surprised us was just how rich, active, and significant Eliza’s life was after Alexander’s death by duel. We also visited a number of historical sites related to the story. I think our favorite--in that it was so impactful to us and on a particular scene in the book--was the Trinity Church graveyard. First of all, we found some humor in the fact that there’s a check cashing business on the other side of the street directly opposite Alexander’s tomb. And that seemed...oddly appropriate in some way! But more seriously, when we visited the graveyard for the first time, the Trinity Root sculpture was still there--a huge 9/11 memorial of the trunk and root system of a tree that’d been knocked down on that terrible day. The sculpture was both sad and haunting and powerful and hopeful--because the roots show all the things beneath the surface that you don’t normally see, but which are vital to sustenance and stability. And that made us think a lot about Eliza Hamilton’s character. It felt, at least in part--in both its sadness and its strength--like an analogy for our book. And that sculpture absolutely influenced the tone of the scene we wrote in My Dear Hamilton that takes place in that graveyard. Q: Most accounts of the Hamiltons, including the famous musical, focus on Alexander rather than Eliza. How would you describe their marriage, and why do you think there's such a fascination with them? A: And that’s a big part of the reason why we were determined to write Eliza’s story rather than a story about their marriage or about Alexander through Eliza’s eyes. We feel strongly that their marriage became a collaborative partnership. Some of Hamilton’s writings are in Eliza’s handwriting and Eliza frequently recounted later in her life about how she’d been Hamilton’s sounding board and muse for some of his most important writings (like Washington’s Farewell Address). It’s important to realize that Eliza was a 23-year-old patriot in her own right when she married Alexander. Her father was the commanding officer of the whole Northern Continental Army, and she’d accompanied him to things like treaty conferences with the Iroquois Confederacy. There are a number of instances early in their relationship that make it clear she voiced her opinion, sought to influence Alexander, and was involved in his work. As far as why there’s such such interest in them, clearly Lin-Manuel Miranda’s masterful Hamilton: An American Musical opened the floodgates to restoring the Hamiltons to their rightful place in the pantheon of celebrated Founding Fathers (and Mothers!). In addition to Hamilton, there’s been the Outlander TV series, and the recent AMC series, TURN: Washington’s Spies, just to name a few. Really, historical TV series from all eras seem to be doing really well. Think of The Crown, Victoria, Downton Abbey, the White Princess/White Queen series, The Last Kingdom, or even the new The Terror. Clearly, popular culture is opening some doors where historical stories are concerned. Q: What do you think Eliza's experiences say about women in the 18th and 19th centuries? 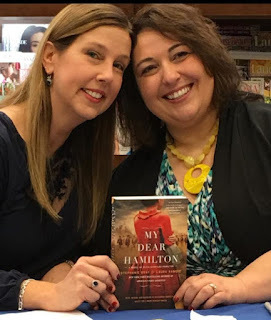 A: In both of our co-authored novels, we saw how much Patsy Jefferson and Eliza Hamilton did to make possible the work and contributions of the important men in their lives. Neither Thomas Jefferson nor Alexander Hamilton would’ve been able to achieve all they did without the assistance and contributions of these women. But what’s remembered and widely known about these women is so little compared to what they actually did and achieved. Our research proves that women were actively engaged in building, protecting, and defending our new nation in ways both large and small. A: We just finished a novel on the women of the French Revolution - and had so much fun collaborating on America’s sister revolution! We can’t wait to share more about this amazing story! A: We feel strongly that centering historical women in their own stories is an important enterprise that makes a real contribution--because stories like ours make it clear that the Revolutionary War wasn’t won by white men alone, and the new nation wasn’t built by white men alone, either. All groups in society--enslaved persons, free black people, Native Americans, and women--played important roles in, made sacrifices for, defended, and contributed to the founding of the United States. Those are all stories that deserve to be told.